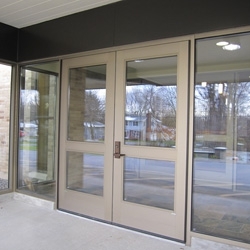 Flower City Glass is a leader in commercial aluminum entrance doors. We have partnered with major door suppliers to bring you the best quality and variety in aluminum entrances and hardware packages to meet your project specifications and offer you alternatives for superior performance. Aluminum entrance door packages can be as simple as a single door and frame with monolithic (1 piece) or insulated safety glass, standard push bar and pull handle, standard maximum security lock with cylinders, threshold, and surface mount door closers. Horizontal Cross rails are available from 1-3/4"-8"
Standard sizes - Door opening sizes only add framing to obtain actual frame size. Finishes - Clear (Silver) and Bronze (Brown) Anodized Aluminum are readily available. A variety of painted finishes are available at a premium and additional lead times. Aluminum door frames can be configured with glass on either side or both sides of door (side lites) and/or glass above the door (transom). If you need a standard or custom entrance, Flower City Glass is ready to assist you with our knowledge and experience to guide without adding unnecessary, costly add ons.